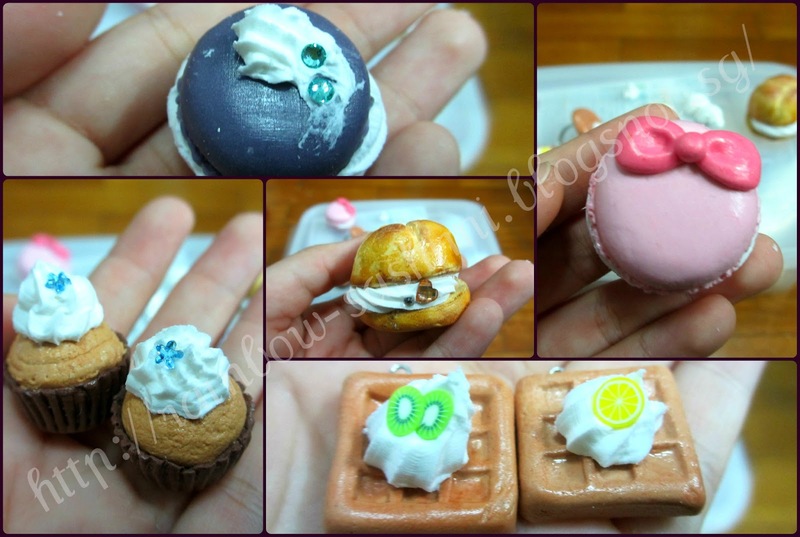 This was the first time I played with faux whipped cream, and it proved to be a very interesting experience for me. You can buy it from Sophie and Toffee. I didn't buy it from them, but the store I bought it from doesn't sell them anymore. You can use this coupon code ( JCSV6NC) for a 10% discount! I piped the cream over my hand made blanks. The purple macaron from Grace clay. The Hello Kitty inspired macaron was made with Hearty Soft. The cream puff is made of Hearty Soft, modified after using the Padico soft mold. The cupcakes were Mermaid Puffy and the waffles were made with some unbranded oven bake clay. Embellishments are rhinestones from Sophie and Toffee and Daiso and nail art fruit canes. So I also tried to mix colour into the clay, basically piping out some clay and adding chalk pastel to it. It didn't really stick to my hand, and mixed pretty well! It piped out easily from my Daiso piping tip. Chalk pastel, being powder, will not make it too wet. I'm sure you can use paint, but you might want to use a tool to mix it as paint will make it really wet and messy! After the clay dries more, it actually worked like normal clay, usable with cookie cutters (big cookie) and molds. A funny thing about the whipped cream clay was that it didn't stuck as well as I thought and they popped off the blanks! （￣□￣；）But it is easily remedied with white glue (or any type of glue). Hope this review was useful! Remember, use JCSV6NC for 10% off!